I’ve been watching the growth of lumps on Peep’s feet for a while now. It looked suspiciously like bumblefoot, but without the characteristic black spot or scab. 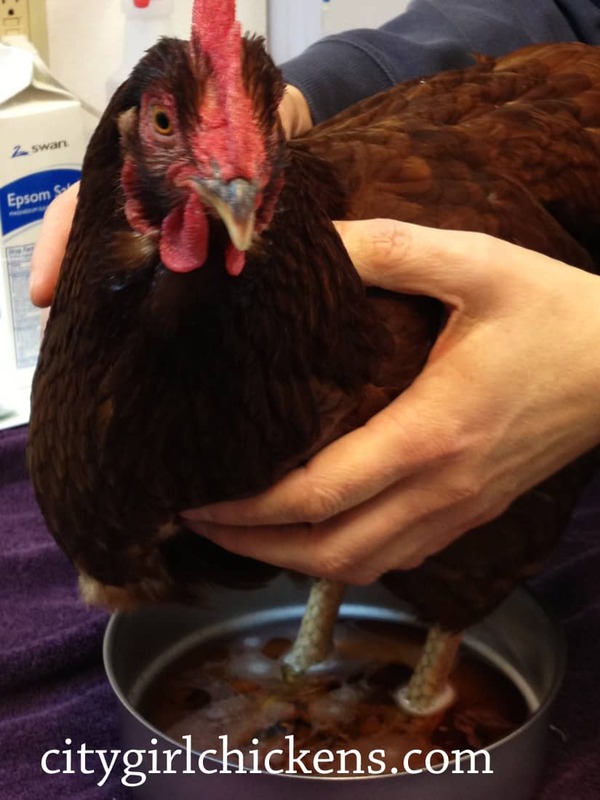 Since bumblefoot can cripple a chicken, and even cause death, it’s important to treat it. The good news is that it is treatable! 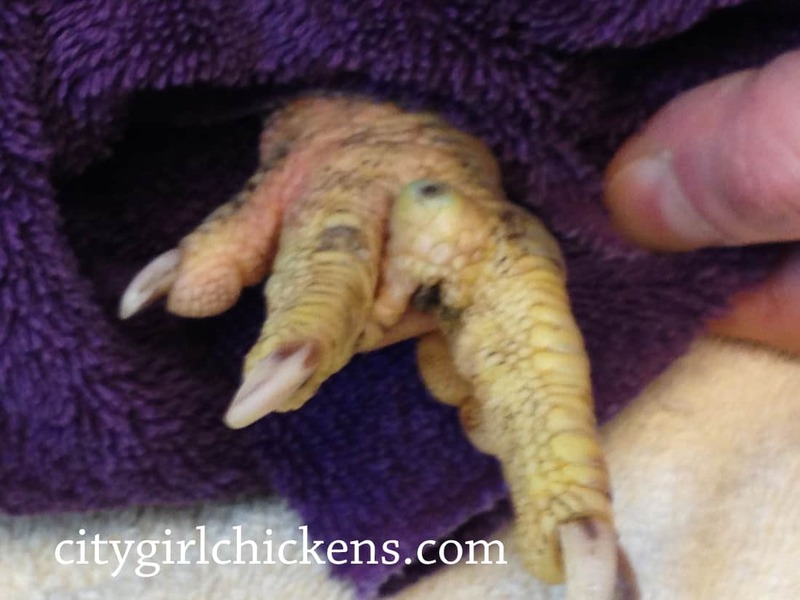 Bumblefoot is a bacterial infection that forms an abscess on the foot or toes of a chicken. It’s most common in birds that live in ‘rough’ environments (rough wood perches, wire bottom cages, etc), but also happens with heavier birds (like Peep) who cut or scrape their feet or otherwise injure themselves (jumping down from a high roost, for example). Although it starts out as a harmless scratch or scrape, it can grow into something deadly for a chicken, as it generally turns into staph (because of this, use rubber gloves when examining the infected area so it doesn’t spread to you). Because Peep’s lumps didn’t seem overly infected, I decided to try an alternative, less invasive route first. For a week or so, Peep received a nightly spa foot soak in water with oregano oil (which is known as one of nature’s strongest antiseptics, and is also good for inflammation and pain) mixed with Epsom salts. Sometimes soaking the feet in the earlier stages helps fixes the problem. I’d plop Peep’s feet into the warm oregano-and-Epsom-salt-laced water, prop up a book for me, and we’d sit together for 15-20 minutes nightly. Although Peep didn’t seem to mind the treatments (nor notice that she began to smell suspiciously like an Italian chicken dish), the lumps didn’t seem to be doing much. Eventually, I noticed a little black dot appearing on the top of one of her lumps, so I texted a friend of mine (who happens to be a cat vet), to ask if she’d help me with a simple bumblefoot surgery. Although she has no experience with chickens, she was happy to assist. We both watched a video on how to treat bumblefoot and I came in to the cat clinic the following day on her lunch hour. As it turns out, a chicken in a cat clinic is of a bit of a novelty. Peep showed her true colors as she was hugged and pet, touched and swooned over. She stayed calm and humored every admirer, patiently standing there like she was used to being the center of attention. 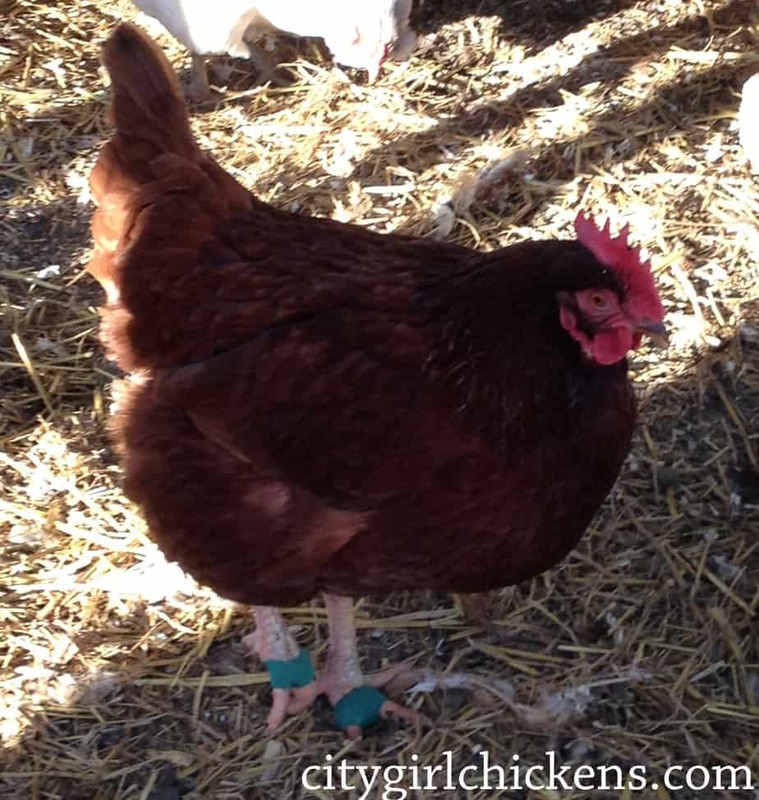 We started out by soaking Peep’s feet in a solution of water, Epsom salts and beta keratin. This cleaned her feet, relaxed her, and softened the tough skin on her feet. Because I wanted to perform the procedure myself, my friend graciously coached through my first ever bumblefoot surgery. I felt more confident with a vet telling me what to do and watching my every move, even if she doesn’t ever work on chickens. Treating bumblefoot is pretty easy. I took a 6mm biopsy punch and twisted it into the infected lump, pulling out a core of nasty smelling decayed flesh. This instrument worked really nicely, so I did some Amazon research and found that you can buy them individually for only $9.95 (and they can be reused several times). definitely a worthy investment. After the core was cut out, I scooped out the remaining decay, while my ‘assistant’ flushed it out with saline. We then applied some anti-biotic ointment (which you can get at farm stores–make sure they’re safe for chickens), gauze and vet wrap. Doing two feet, from start to finish took less than one hour. (However, if I were to do it again, I’d do one foot at a time so she’d have one ‘good foot’ to use while she recovered.) She just laid cradled in the arms of a vet tech while I cut and bandaged. She barely moved and didn’t make a single sound. Post surgery. Feet all wrapped and ready to go. Now that I’d done it with professional help, I feel pretty confident to do it on my own if the need ever arises again. After the fact, I see that I could have actually done it on my own the first time around, although I appreciated the support (and the needed tools). Out in the chicken run with her bandaged feet. Peep needs to wait a few days for her bandages to come off completely. In the meantime, she’s back in the coop and managing quite well. I change her bandages daily, adding more anti-biotic ointment, fresh gauze and vet wrap. She’s healing up wonderfully. We shot some video of the whole procedure if you’d like to watch it (it’s completely unedited). It might be a bit graphic for some, but it will give you a good idea on how to perform your own bumblefoot surgery should you need to. The first video is of the actually removal of the abscess, the second video is the wrapping of the foot with bandages. Also, if you’re interested in a biopsy punch, you can get one here. And if you’d like to watch the video we watched beforehand, here’s the link. Kathy, the Chicken Chick, does a great job at explaining things along the way. I have a friend whom I found out (after the fact) had to put down one of her hens recently because of bumblefoot. 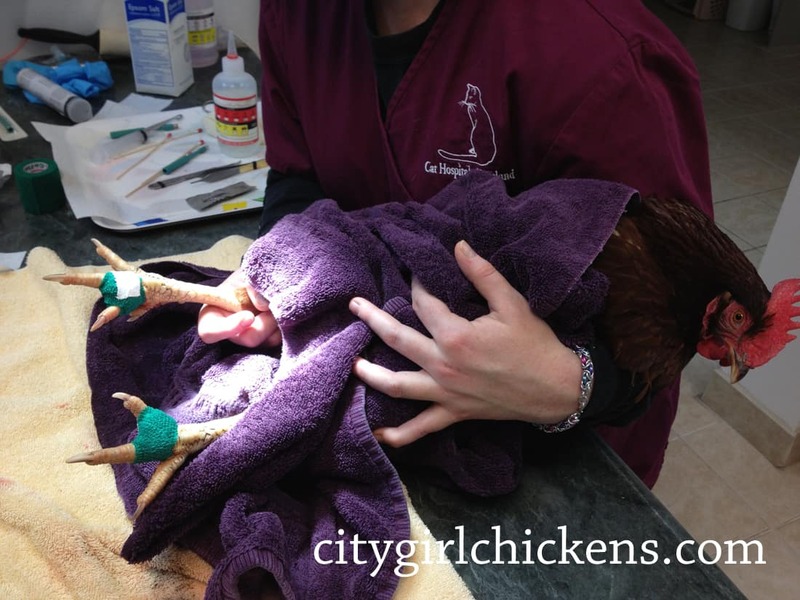 I’m not a vet, and I can’t give chicken advice, but I can say this procedure is easy and a good solution for Peep. It’s a quick, easy alternative to crippling and death.